Death Valley National Park protects over 3 million acres of Mojave Desert, famous as the hottest, driest and lowest place in the nation. Despite those extremes it is home to a diverse amount of wildlife species: 56 mammals, 36 reptiles, 5 amphibians, 6 fish, and nearly 400 bird species have been found in the park. Habitats vary from salt pan below sea level to the subalpine conditions found on the 11,049' summit of Telescope Peak. In between are sand dunes, canyons, alluvial fans, badlands, rocky ridges, and spring-fed wetlands. Vegetation zones include creosote bush, desert holly and mesquite at the lower elevations and range up through shadscale, blackbrush, Joshua tree, pinyon-juniper woodlands, to limber pine and bristlecone pine. Annual precipitation varies from 1.9 inches on the valley floor to over 15 inches in the surrounding mountains. Shy and ellusive, bighorn sheep are the park's largest native animal. Watch for them in canyons and on mountains slopes. Kit fox are the size of a housecat and have large ears and tail. They are nocturnal and most common in lower elevations. Common throughout the park. 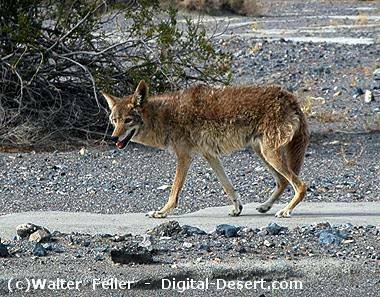 Coyotes are excellent scavengers and hunters; they do not need your handouts. Do not feed coyotes and other wildlife! These tiny, pale squirrels are common in the desert shrublands. White tail is held over its back to reflect sunlight. Also known as pack rats, these nocturnal rodents love to collect things and pile them in their middens. Nocturnal kangaroo rats are found in dry areas on the valley floor, especially near mesquite. 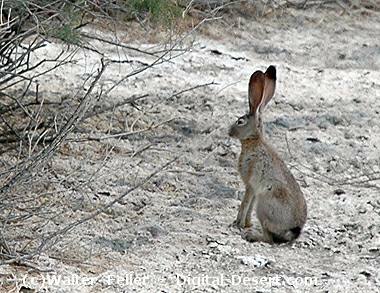 Jackrabbits are most common in the mid-elevations of the park. Watch for them on moon-lit nights. Bats are usually seen at dusk, The most common species found in the park are the California myotis and the western pipistrelle. Tiny native pupfish are found only in a few isolated springs and creeks. Four species live in the park; the Devil's Hole pupfish is an endangered species. 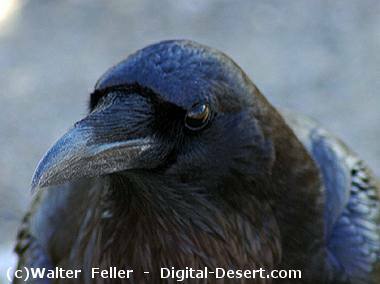 These ground-dwelling birds are found in the lower elevations of Death Valley. They eat lizards, insects, snakes, and small birds. These sleek birds are often found in noisy flocks near developed areas. Males are glossy-black with long tails; the brown females have shorter tails. Ravens are common throughout the park and are often found in pairs. These clever birds eat a great variety of food. Chuckwallas are the largest lizard in the park. Found near rocks, it will squeeze into a rock crevice and inflate itself when threatened. 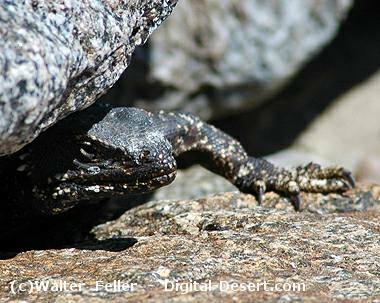 Well camouflaged, these lizards are often found near ants, their primary food source. Watch for them crossing dirt roads in the park's mid-elevations. 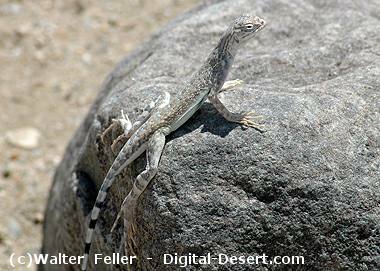 The pale lizards are common in the lower elevations of the valley. They lift their black and white striped tails high when running. The rattlesnakes are found mainly in lower elevations. Though venomous, sidewinders are not agressive when left undisturbed. 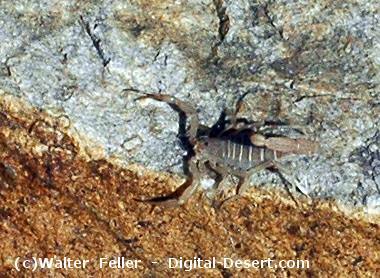 Scorpions are nocturnal and hide under rocks from the desert sun. All scorpions have a venomous sting, but those found in the park are not deadly. These harmless, ground dwelling spiders are most often seen crossing roads in autumn. 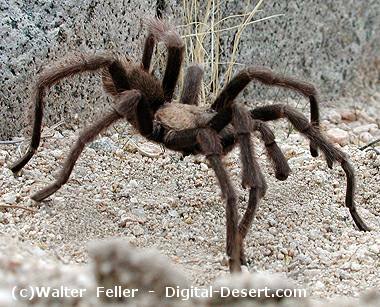 Look for them in the higher desert valleys.